Uber quick post here with a very simple fix. I got the following error when upgrading my C# viclient from 5.5 to 6.0 and connecting to my new vSphere 6 vCenter instance, and even when connecting to older ESXi hosts directly. (Yes I’m a bit old school – not a web client fan even after several years!). The following error was observed after connecting and authenticating to vCenter, when the screen was populated with objects. I also could not then connect to any VM console as it said it was disconnected. To collect data to submit to VMware technical support, run "vm-support". Simple fix for a silly little bug which is most likely related to me running an older version of VMware Workstation on my machine (in my case v8 but it could apply to any older version potentially). Having taken delivery of a new Intel NUC D34010WYKH this week, I followed the usual (and Intel recommended process) of upgrading the firmware / BIOS to the latest version. As it happens, this was version 0030 (WY0030.BIO). This was installed using the standard USB with a .BIO file, and press F7 method as there was obviously no OS installed. Unfortunately having installed this version, building and booting the ESXi host, I was getting some very strange network issues. Specifically no DHCP address being picked by the host, but a manual IP would ping intermittently (around 10-15% of the time). Not good. In addition there were some very odd behaviours observed in the BIOS such as not booting from USB consistently, hanging when I hit ctrl-alt-del and others. My guess was that this was a firmware related issue, so I decided to roll it back to an earlier version. I started with 0026 by installing the firmware using the same F7 method above. This is when I got an error message which stated FwUpdateFullBuffer followed by several numbers (no screenshot I’m afraid). At this point, the firmware update bombed out. Really not good! Repeating the activity only achieved the same result, even with different firmware versions and install methods (such as a bootable USB drive with FreeDOS and iFlash2.exe). Copy the recovery file (*.bio) to a bootable USB device. 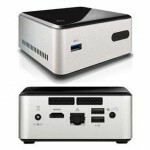 Plug the USB device into a USB port of the target Intel NUC. Shut down the computer and unplug AC power. Open the chassis and remove the yellow BIOS Configuration Jumper. See the Technical Product Specification for the location of this jumper. Wait 2-5 minutes for the update to complete. The computer will either turn off when the recovery process is completed or it will prompt you to turn off the computer. Remove the USB device from the USB port. Replace the BIOS Configuration Jumper. Following the above, I have updated my Intel NUC D34010WYKH to version 0025 and have found it to be reasonably stable so far, and definitely works with ESXi. Obviously follow any of the above suggestions at your own risk. I cannot be held responsible if your NUC becomes a BRICK, but hopefully this will save people some time and frustration, as this was several hours of messing around in my case!